The collection includes 109 wall posters of the Italian Social Republic (RSI) acquired in 1965 by the former Institute for the History of the Resistance in the Tre Venezie, then the Veneto Institute for the History of the Resistance and Contemporary Age (IVSREC), now the University Centre for the History of the Italian Resistance and the Contemporary Age (CASREC). 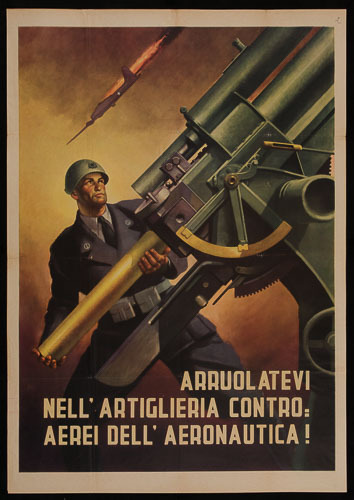 These large posters (76 contain text and images, 33 contain text only) represent significant testimony of Fascist propaganda between 1943 and 1945, the period in which the Resistance developed in opposition to the Italian Social Republic which was constituted by Mussolini in September 1943, following the collapse of Fascism. 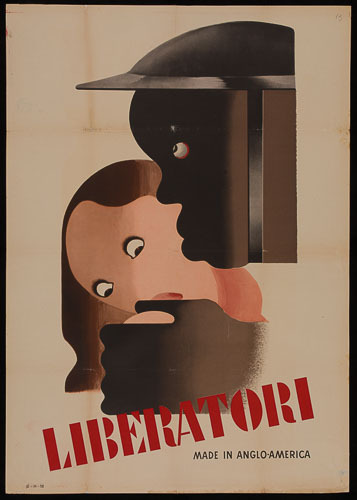 Posters were one of the main tools used by the Italian Social Republic to convince people to adhere to fascist values and to enlist in units such as the 10th Light Flotilla or the Volunteer Militia for National Security, remaining faithful to its old ally, Nazi Germany. 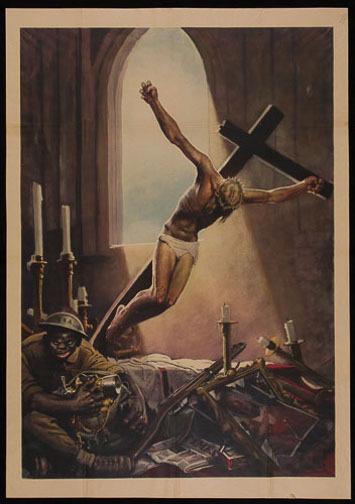 Many of the posters presented here refer to the 10th Light Flotilla which worked in collaboration with the German units against the advance of the Allied Forces and in operations against the Italian Resistance, at times using violent methods of repression. 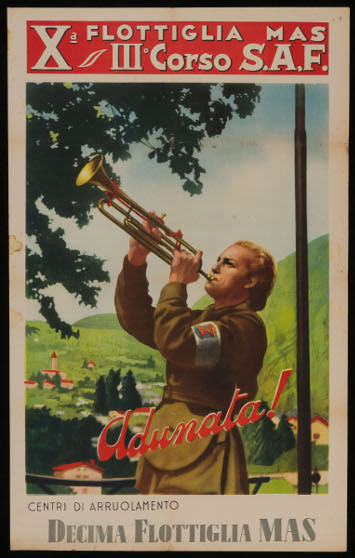 Even women could enlist in the 10th Flotilla, as seen in the posters of the woman playing the trumpet for the gathering of the III S.A.F. 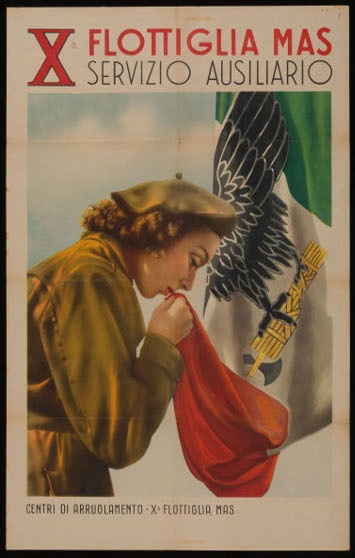 (Servizio Ausiliario Femminile – Female Auxiliary Service) training or the woman in uniform kissing the flag (10th Light Flotilla, Auxiliary Service, Enlistment Centres). The call to enlist (in To Enlist in the Italian SS Italian Legion: Honour Loyalty Courage...) addressed to different categories, such as the one for doctors (Future Doctors! Serve your Country by serving humanity: enlist in the white army of the Red Cross...), the exaltation of values like honour, presented as loyalty to the German ally (Germany is truly your friend...), work, country (Work and fight for your country, for victory...) and family (A father’s work provides well-being and joy to his loved ones...), the call to defend Christian values endangered by the advance of the Allies (Crucifix askew and backlit; an African-American soldier at its feet and in its shadows looting sacred objects: 1944), allusions to the Red Menace (Mothers of Italy the red monster wants your blood: remember that!...) are hinted at in the different posters with images which are often ironic and disparaging towards the Allies (Here are the “liberators”. Europe is fighting and will fight for its life...), and in many cases presented as black invaders (Do we want to be controlled by negroes? No! Never!...). 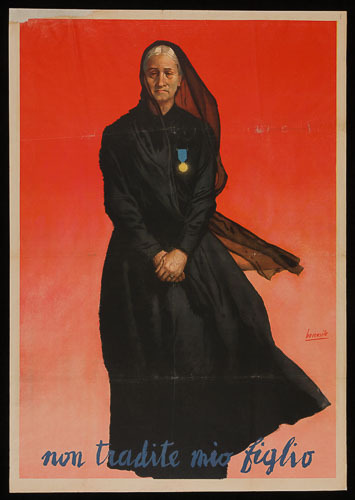 If these propaganda posters – in the truest sense – are characterised by their use of colour images, they are often accompanied by slogans; others, instead, use a more sober graphic style. These are calls to enlist (Enlistment: students of the third year with the rank of Corporal, students of the fourth year with the rank of Sergeant, etc. ; anyone who respects himself and his home does not compromise honour. Hasten, young people, where honour has never been challenged...) proclamations (To avenge the thousands and thousands of deaths in Abano, Treviso and Padua, and the hundreds of school children from Gorla...) or simple announcements and notices. When the posters were acquired, they had been kept folded up on top of each other inside cardboard box files. Following careful restoration undertaken in collaboration with the University of Padova Library Centre, they are now preserved, lying flat in a drawer, at the Library of the Department of History. 2003/05: Restoration, preservation and digitization of the collection of "Manifesti di propaganda della R.S.I."